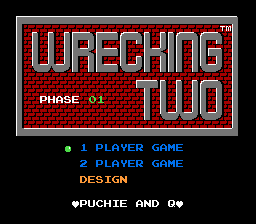 Wrecking Two is a two player co-op hack of Wrecking Crew. A second player is required to play. Spike is controlled by player two. Purple wrench enemy is stationary. 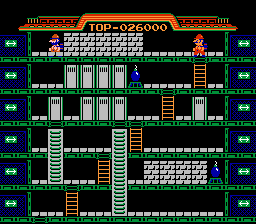 The original Wrecking Crew has a lot of mechanics that are either under-utilized or not required to solve puzzles. This hack aims to teach these mechanics to the players as they master 100 new levels built to test their knowledge of the game. This is a co-op game experience with player one as Mario and player two as Spike. Mario and Spike have different properties so switching characters after one playthrough is recommended to get the full experience. Pausing the game allows player one to scroll the level up and down to see things off-screen. There is a known issue where Spike’s controls are wonky on bonus stages only. This doesn’t impact regular gameplay. Select “1 Player Game” on title screen to play.